My first encounter with the work of David Lynch was going to the cinema and watching the film ‘Lost Highway’. Those were different times. We had a different view on music and how it should be, and also, on movies. The little scary guy, meeting Fred Madison at a party and convincing him that he is, as they speak, in his house as well, had an impact on me, manifesting some sort of pre destination that involved, or will involve, a growing interest in loops, time displacements and space disruptions. Now I am holding Eepocampe’s album, called ‘When things go abstract’, and if I understand correctly, serve as some sort of a tribute, even if minimal, to Lynch. I hear soundbites from him on the title track, and I try to connect them with the album I am listening to. I look at the cover and I feel strange. The door that is standing in the middle of the picture looks like the door to my bedroom, and the window, with a torn net hanging on it, like the window my cats have transformed into their doorway in and out of my house. Here’s a little lynch-like dark mirror for me to start the morning with, I guess. 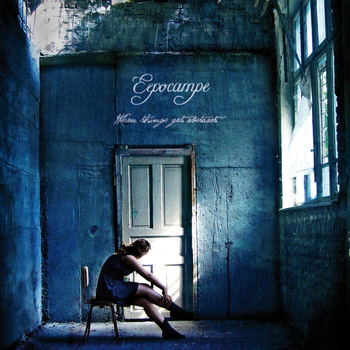 Eepocampe’s music is well produced and shows high standards of quality, no doubt. It lies somewhere between the sound and mood of alternative bands from the golden nineties, in addition to more specific bands like Porcupine Tree and Archive. We have guitars that play in spirals while the drums lead the music in and our of rock climaxes, much to the joy of anyone who might love this genre of music. The singing is clean and, although well worked on and well crafted, sounds sincere and appealing. I listen to the words of David Lynch and I am not sure I can understand the relationships between him and the ideas of the song and album, but it sounds good anyway. The last song is another highlight for the album, as the song explodes finally into a post rockish odyssey with harder, more furious drums that lead the way to more distant, yet energetic singing. I listen to this album and I think that although this is not my cup of earl gray tea, I do appreciate the powerful, relatively speaking, dynamics that Eepocampe employ throughout the album. Fans of this music should run and grasp this album immediately, I am putting my money (I have none) that they will like it.